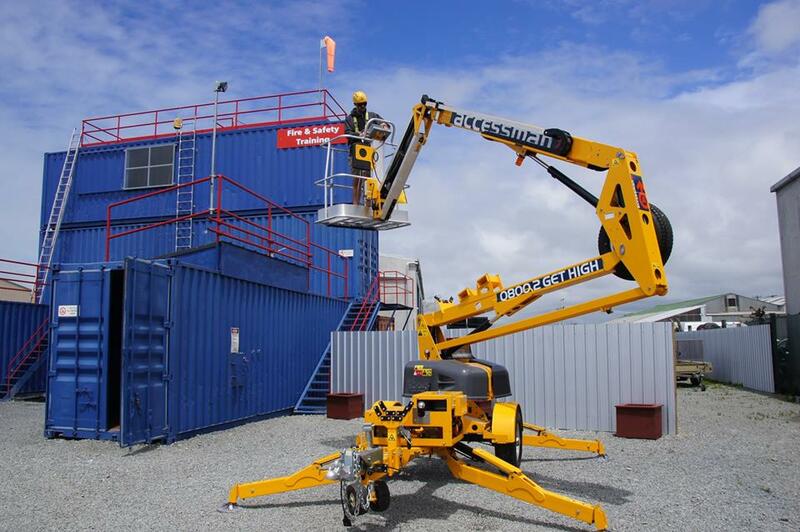 Great day for EWP training in Timaru last week. Ali, our North Island Manager with the beautiful Korowai presented by the Ahuriri Maori Wardens. They will add their beauty and dignity to the entrance to our Napier campus. Ali, our North Island Manager with donated Korowai. F&ST Timaru’s revamped climbing structure for practical height training is now in action – and it’s great. Trainers and trainees are loving the multiple options for realistic height scenarios. And the view from the top is amazing (if you have your harness on)! Nathan and Ian have been in Sydney this week updating their skills and trying out new technology for safe rope access work. Congratulations to the eight Oceana Gold Emergency Response Team members who completed the annual Sky Tower challenge in Auckland on Saturday. Andy Prescott was first in the masters category with an impressive time of 11:05. Two others came in 5th and 6th in their respective categories. F&ST was proud to sponsor them. Our four breathing apparatus (BA) technicians were all re-certified following an intensive two day course run on out site by Kevin McCoomb from Scott Safety, Australia. They also completed cylinder valve servicing and testing. This training is required every three years to ensure the guys are up to date with aspects of maintaining and servicing BA sets and cylinders. We sell and service a number of sets. For details, check out our sales page. The boys have been testing out a powered ascender – easy to operate and comes with a remote control. They loved it. See them in action on our Facebook page. No, it’s an Industrial Emergency Response Team celebrating after successfully completing their hot fire training this month. We’ve run our first course for unit standard 12310, Extinguish small fires on-board a vessel. A small group of Coast Guards and Commercial Fishers attended and taught us a lot! We were approached by ISN to contribute an article interpreting the new HSWA regulations on emergency planning for businesses. You can read it by clicking here. Alternatively, you can click here to go to Industrial Safety News’ website and read the digital edition. We are in the May/June edition on page 5. Meet the top team (of 13 in their age group) from the Fencibles Club in Auckland. And F&ST is their proud sponsor. Last year they were third in the National tournament. We wish you another successful season, boys. Our trainer Anthony has successfully completed his Driver Instructor training, gained his ‘I endorsement’, and will be doing our 4WD training. Neal, our driver trainer in Napier starts a series of Emergency Driver training sessions in Early January. Our wee F&ST duck wore Breathing Apparatus and a mask on Sunday 15 November at the 17th Duck Race for Diabetes. Sadly it didn’t help him swim f&st enough to win, but it was all in a good cause. This year’s rural fire challenge at Raincliff, inland South Canterbury, coincided with gale force winds across Canterbury and Otago. Some of the 120 rural firefighters scheduled to attend were too busy fighting the real thing. However there was still plenty of action across multiple disciplines, and F&ST was there to help.